I was at Town Square the other night and we were looking for something to eat that was on the lighter side and if possible something different, when I saw the sign for Coconuts Beach Bar & Mexican Grill. Before making our decision to eat here we decided to check out the menu first before going in just to be sure there was something on the menu that sounded appetizing. The prices didn’t seem too bad ranging from $8 – $16 depending on the the entree. I will fess up that I am not a huge fan of mexican food; I have a few items that I really like and I can almost find at every restaurant, tacos or tortas, doesn’t get much simpler than that. They had a couple taco plates that looked good so we decided to give this place a shot. We were greeted quickly and seated immediately; which I can see why there was only 4 parties excluding us in the main dining area, and this was around 6pm I would say on a Wednesday. I guess the emptiness should’ve been a sign. The dress code was certainly on the casual side which fits with the beach theme, the girls were in short shorts wearing tank tops & bikini tops this dress code showed off the hostess’s lower back piercing so they obviously go for the fun & casual dress at work. The male waiters were wearing life guard themed outfits white tanks that said coconuts and red swim trunks. The decor was cheesy beach cabana. The place felt like a dive bar to be honest, but maybe that is what they want it to feel like, considering at night this place turns into a club with dancing, drinking and partying. On to the food we pretty much knew what we wanted when we walked in since we had been debating the menu outside. The waiter came over shortly after we had been seated took our drink order and then came back for our food order. We went with the grilled fish tacos and the al pastor tacos. While we were waiting for our food we wondered if we got chips and salsa with our meals like most mexican restaurants and that would be no, you have to order this as an appetizer which I found out was $5, on the menu it does not say unlimited and the basket was about average from what I could tell at the neighboring table. To our surprise both of our dishes came with rice and beans, since the menu didn’t list that they came with anything so we were only expecting the tacos. 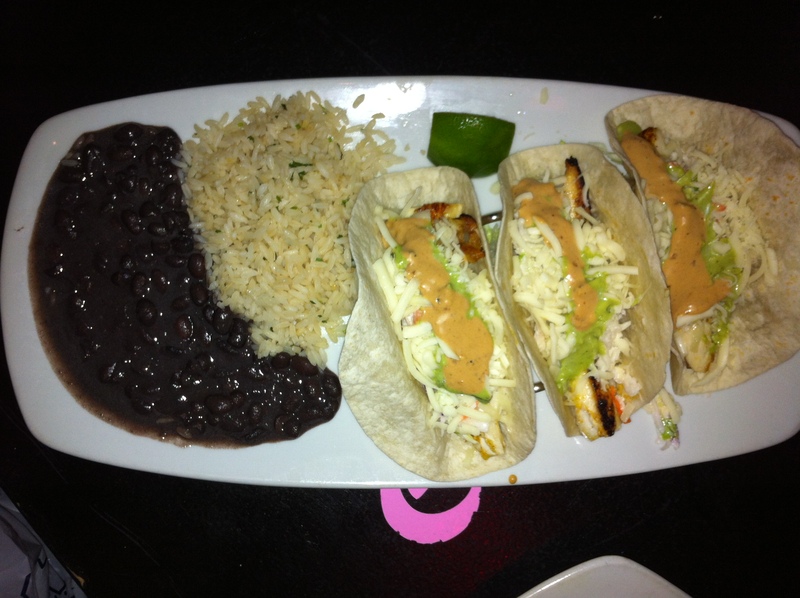 The grilled fish tacos are grilled mahi-mahi with baja slaw topped with cabo sauce & their 3 cheese blend on a flour tortilla. This was a really nice taco, not greasy and the fish was cooked perfectly. The spicy cabo sauce was a nice element and really blended well. I wasn’t sure what the difference between baja slaw and normal slaw because it tasted like normal slaw to me nothing special. Over all I liked this taco it wasn’t the best fish taco I ever ate but it wasn’t the worst either. 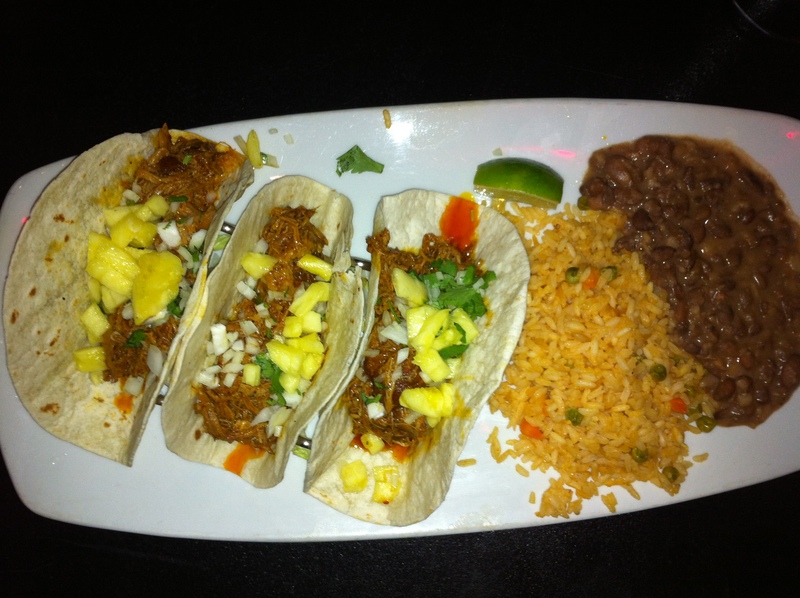 The al pastor tacos is roasted pork with a Achiote marinade on corn tortillas, since I am not a fan of corn tortillas I asked for them to be made with flour which they did for me. I did not expect pineapple on top since it wasn’t listed but due to a conversation with a friend she had mentioned to me a couple days beforehand that al pastor comes with pineapple normally. You can see from the photo that they were a little greasy from what I can assume was the marinade. I am on the fence with this taco dish, first off my food was luke warm it really could’ve been a lot hotter so this was a disappointment. These are not a spicy pork despite their orange coloring, most of the time this eludes to spicy. There wasn’t a lot of flavor actually to the taco most of what flavor I recognized was from the pineapple. Which you wouldn’t think would be good; kind of like pineapple on pizza, but it did work well with the pork. Overall it was just a taco not bad but not fantastic either kind of right down the middle, if someone gave me a free one I would still eat it but I wouldn’t crave it. I didn’t care for the rice & beans that came with my dish, the rice was bland and the beans were a weird texture almost like they had started to mash them up to make refried beans but changed their mind, and actually they were on the watery side. I would say that being in town square there are a lot of other choices which I think you would enjoy more than this. I would not go out of my way to come here again, even though together our total bill was $23 without tip; the waiter did not add our drinks on to the bill which was just a soda & ice tea. I am not sure if it was an oversight or he was just being nice. The service was so so we waited a bit for our food but the waiter did check on us a couple times throughout the meal which is good. So for the price it was fine especially since we had the surprise rice and beans, but I know the next time I am in Town Square this place will be last on my list for food. Especially when as we walked around we both said that we should’ve gone to Tommy Bahama or Brio instead as we walked past them. Also afterwords I mentioned to a friend I went there and the first thing she asked me was why? I guess that sums up this place, and since this use to be a place called Lolitas I can honestly say it wouldn’t shock me if it became something else in the future.